ven without the myth of a man scorning bourgeois comfort and wealth to pursue his aesthetic vision all the way to the exotic climes of French Polynesia, Paul Gauguin may still have become an important artist who influenced the course of Modernism. But would he have become quite so famous? Gauguin is inextricably joined to those final island years in Tahiti and the Marquesas, with his flat but brightly colored portrayals of the free-love paradise he claimed to have found. The brilliance of Gauguin’s legend is in no small part that he created it himself, carefully crafting and diligently maintaining it with the 19th century equivalent of a well-caressed social media presence. That a factual basis behind the myth is thin doesn’t deter curators, since the man’s art justly remains a big draw at museums. 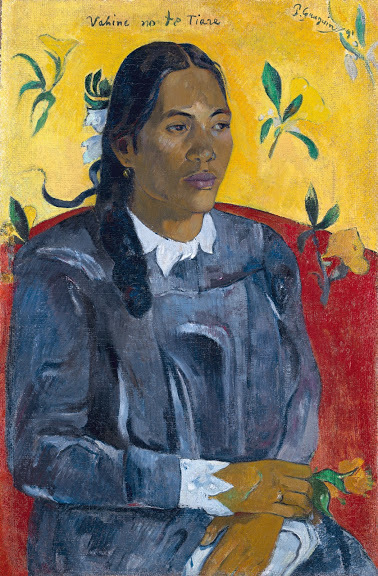 San Francisco’s de Young Museum is showing Gauguin: A Spiritual Journey, through June 23, 2019. It is the first major Gauguin showing in that city and is almost entirely made up of works from Copenhagen’s Ny Carlsberg Glyptotek, which needed to clear space for a major exhibition of their own. Rather than put their collection into storage, the Copenhagen curators sent it to San Francisco, to the great benefit of West Coast art-lovers. Calling the exhibition “A Spiritual Journey” is a bit of a stretch, but the visitor does have a chance to see a chronicle of a very good painter determined to reinvent himself until something worked. Visitors hoping to see copious canvases of sun-drenched Tahitian maidens with grim totemic gods looming in the background will be largely disappointed. 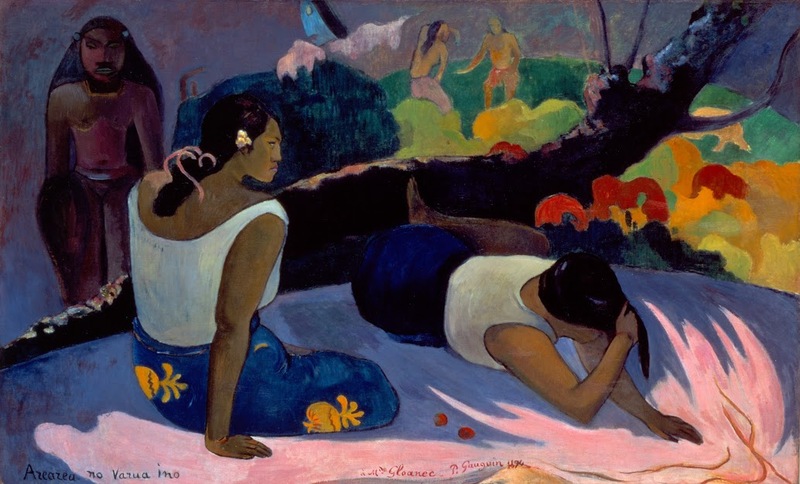 There is one fine example of that iconic phase in Gauguin’s career, “Reclining Tahitian Women,” [see below, left] but the more interesting and numerous works are from earlier and less well-known parts of his development. On entering the hall, “Sailing Vessel in Moonlight,” a painting from 1878 that looks nothing like what we think of as a Gauguin, greats the visitor. The self-taught Gauguin’s command of depth and perspective gives an uncanny three-dimensional impression that jumps off the canvas. Equally striking is the painting’s dark and foreboding palette, which arrests the eye and stands in sharp contrast to the light palette of Gauguin’s Impressionist phase. Early on, Gauguin seemed to try on different styles as if they were costumes. Walking through the first half of the exhibition one sees Gauguin as Pissarro, Gauguin as Degas, Gauguin as Renoir. 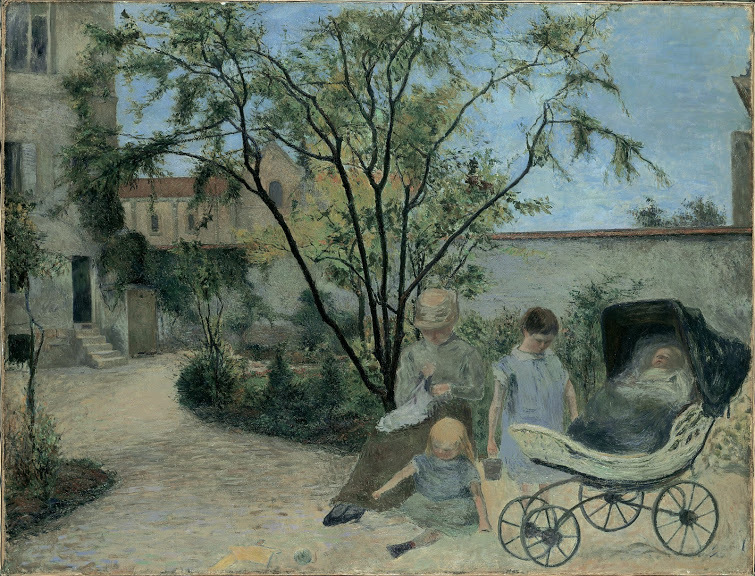 (“The Painter’s Family in the Garden, rue Carcel” [below] is a fine early work that shows the close study he made of Degas and Renoir.) A welcome feature of this exhibition are paintings by Pissarro at one time owned by Gauguin, paired with works by the latter that allow the viewer to see the strong influence the older Impressionist had on him. These pairings support the perennial criticism that drawing was never Gauguin’s strong suit; still, his works can have a raw emotional intensity Pissarro’s lack. Gauguin never surpassed the Impressionists beside whom he was showing (he participated in all of the Impressionist exhibitions from 1879 to 1886), but his native talent and gifted eye are obvious. He was, at the very least, a better than average Impressionist whose works from this period deserve to hang in museums alongside the masters of the movement. Gauguin was fascinated with primitive art. Biographers have traced this to a childhood spent partly with his mother and her relatives in Peru where he was exposed to local artifacts. In a foreshadowing of modern trends, Gauguin falsely claimed to have Inca blood, attributing his self-identification as a “savage” to this ancestry. If Gauguin’s bloodlines told any story, it was that of the colonial overlords—his aristocratic great-uncle was the Spanish viceroy in Peru. Gauguin’s time in Peru was spent in comfortable surroundings, waited on by native servants. His pursuit of the primitive first took him to study French Bretons in their native habitat at the popular artist colony at Pont-Aven, where locals had discovered that playing up their costumes and customs attracted artists wanting to summer outside Paris. 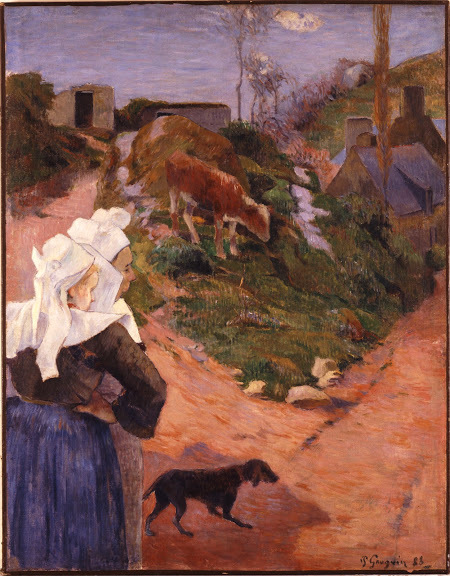 His work from Brittany is represented in the San Francisco exhibition by several paintings, most notably “Landscape from Brittany with Breton Women,” [left] a fascinating transition piece that has remembrances of Impressionism in the background but foreground figures that show his experiments with Cloisonnism (relatively solid blocks of color outlined with dark lines similar to the effect of stained glass) and with flattened perspectives that would become more pronounced in his late works from Tahiti and the Marquesas. The first flashes of Gauguin’s stunning use of color appear in these Brittany pieces. He sought exotic climes in the French colony of Martinique with Charles Laval, not for the first time taking advantage of a government policy by which citizens were transported back home at public expense if their money ran out. He even painted with Van Gogh for a time— ending with the famous row and the lopped-off ear. Whatever Gauguin’s other qualities, he certainly had a knack for making memorable personal connections with painters whose works would eventually land in the Musée d’Orsay. Gauguin’s journey ended in his island paradise, where he died in 1903. The collection contains early well-executed scenes of Tahiti that hint at the westernized French colony that bitterly disappointed the romantic Gauguin upon his first arrival, as well as the striking “Tahitian Woman with Flower”—an echo of formal European portraiture, with a local woman in demure Western dress that was probably more typical of what he saw. Gauguin’s chunks of brilliant yellows and blues are there, but so are surprisingly subtle textures and shadings. The de Young curators do an admirable job of fleshing out this end of the exhibition hall with pieces of primitive art from its rich Oceania collection. The Glyptotek’s collections of Gauguin’s crudely-shaped ceramics and painted bas-relief wood carvings on primitive themes visually seem also to be part of this final phase of Gauguin’s career. They actually were done, however, before he left France, confirming that he had already decided what he intended to find in Polynesia. Gauguin is a rich target for the lamentable trend toward rejecting works of art simply because an artist has posthumously run afoul of contemporary social and political sensibilities. Feminist, anti-colonial, and cultural appropriation critiques of the man practically write themselves. He preached to a staid European audience about a pristine paradise that he had imagined, not discovered, and near the end of the exhibition one encounters a photograph of Gauguin’s “Maison du Jouir” (House of Pleasure), where he possibly spread diseases to and certainly begat children by underage and presumably impoverished girls. Far from learning to be an enlightened savage in tune with nature, he was himself the worst kind of colonial—taking according to his frustrated European desires and giving little of value in return. There is a sense that in this period of Gauguin’s life for which he is best-known, the art itself in some ways had become secondary to his self-serving fantasies and his cultivation of a personal legend. His vision of an exotic libertine paradise full of noble savages was tailor-made to boost his reputation during the sexual and social revolutions that began in the 1960s. Today, when little quarter is given to cultural appropriation and even less to masculinity, he is having a rather rougher go of it. The legend of Gauguin earned him the fame he sought throughout his life, but it will also forever tie the fortunes of his legacy to the shifting sands of social fashion.